Brutal 'trash bucket challenges' spread Jump to media player As Ukraine prepares for parliamentary elections at the end of the month, a series of what are being called "trash bucket challenges" are spreading across the country. 'Tension and sudden anger' in Crimea Jump to media player Despite a rising tide of diplomatic pressure from around the world, Russia insists its troops will remain in Ukraine until the political situation has been normalised. Ukraine crisis: Human rights abuses Jump to media player Human Rights Watch in Moscow has published evidence of human rights abuses in the regions controlled by pro-Russian separatists. 'We may reach the point of no return' Jump to media player European Union foreign ministers have expressed concern at Russia's aggression against Ukraine. Ukraine strengthens ties with EU Jump to media player Ukraine's parliament has ratified an agreement that strengthens economic and political ties between Ukraine and the EU. As Ukraine prepares for parliamentary elections at the end of the month, a series of so-called "trash bucket challenges" are spreading across the country. 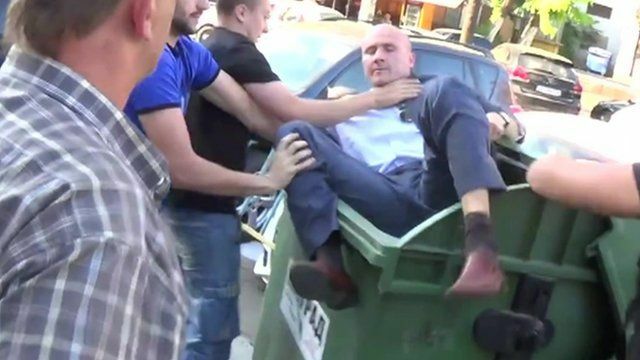 Activists, many from the far right, are throwing politicians whom they say are corrupt into rubbish bins. Some of them have been brutal, and one official was also severely beaten. Critics have called the actions mob justice, and ask what this means for the rule of law in Ukraine in the future. David Stern reports from Kiev. The BBC has not been able to fully authenticate some of the footage in this video, but based on additional checks made on it, it is believed to be genuine.